Face is the most important part of one’s personality. Facial beauty of a person is what one looks at while forming a first impression on another. Everyone wants to look more and more beautiful, handsome or attractive. Many people are not fully satisfied with the look of certain part of their face. 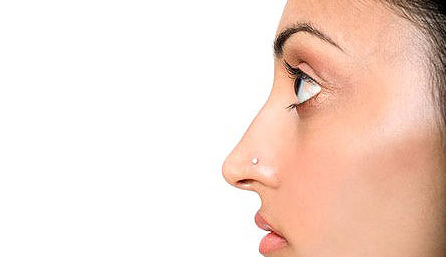 The centrally placed nose plays an important role in the over-all look of a person. Every ethnicity in the world has its peculiarities in the shape of the nose. The Europeans have longer noses, Africans have upturned noses, The Chinese and Japanese have small noses, etc. So the shapes and sizes of a nose are according to the ethnic background of a person. Hence, a perfect nose can’t be measured in terms of millimeters or centimeters. A perfect nose is one that is in perfect proportion with other aspects of the face. A nose that compliments the face is always considered beautiful. Most people are not satisfied with the shape of their nose, some are not happy with the size. In medically advanced countries like England, France, United States of America and European countries it is fairly common for people to have had some form of plastic surgery done on their body. Rhinoplasty or Nose job being the most popular plastic surgery performed. Unfortunately the results are not as expected and in more than 60% of cases they have to operate again as corrective or Revision Rhinoplasty. Revision Rhinoplasty is fairly common as even if the doctor has done a good job, chances are that the nose looks better in the picture than on the Client’s face. Also, surgery involves its own set of risks. There is risk from the General Anesthesia given, risk of infection and risk of complications. Adding to this, the fact remains that in any type of surgery the estimation of fees one is told is that of the surgeon. The anesthetist, operation room charges, hospital charges, post operative procedures charges and medicine charges are extra. These additional expenses are also considerable. Now there is an alternative to plastic surgery, it is Aesthetic Acupuncture. Acupuncture is one of the oldest, most commonly used medical procedures in the world. Acupuncture originated in China more than 5,000 years ago, making it one of the oldest and most commonly used medical procedures in the world. The effects of acupuncture are miraculous in most cases. Acupuncture is very reliable in a lot of ways as it works on the belief of making whatever is sub-normal or abnormal in the body, normal. The shape of a nose depends on how different muscles in the nose and surrounding area are ‘ holding’ it. Also important is the fat deposition and thickness of the skin. Acupuncture has 6 definite curative effects on the human body. One is of motor recovery. In this effect an individual muscle can be relaxed or lengthened and another can be contracted or shortened. Reducing fat is easier with acupuncture. Thus any nose can be re-sculptured and made more beautiful, shapely, and perfect for ones’ face. The basic principle of acupuncture is “ Whatever is ab-normal or sub-normal; can be made normal with acupuncture treatment.” It is subnormal to be imperfect in shape and look. It is normal to be beautiful. The procedure is simple. It takes only 3 to 20 minutes of acupuncture and manipulation to acquire the desired result. It may take 1 to 5 hours to stabilize the good effect. There is minimal pain and a slight soreness. But the results are amazing. This is subsidized fee for initial batch of patients. There after double the fee is applicable. Acupuncture is now taking the lead over modern medicine in most countries of the world. Acupuncture not just being a therapy but a complete medical science is now accepted in Europe, Australia, England and America. There are licensing authorities, rules and regulations of practice and medical insurance for Acupuncture as almost 40% of people visit Acupuncture clinics. Aesthetic Acupuncture is a Super Specialty of Acupuncture Science. Only a selected few experts practice Aesthetic Acupuncture. Prof.Dr.Prakash Verekar is one such practitioner. Prof. Dr. Prakash Verekar has an International license of Acupuncture by the WHO. He is a visiting professor in The Open International University for Complementary Medicine, Colombo Sri Lanka. He is also attached to The International College of Alternative Medicine, Ontario Canada as a guidance professor for Asian countries, England and France.